Download Eerie Publications Comics | Books Inc.
Download Eerie Publications comics here at Books Inc, where you can have instant access to a digital catalogue of classic comic stories brimming with all manner of shock, horror, murder, mayhem and mystery. First hitting the newsstands in 1966, Eerie Publications spent the next 15 years releasing a myriad of titles to raise the pulse and sweat the palms of its avid readers. Featuring ghastly, lurid covers and fiendishly fearful artwork, Eerie Publications were responsible for seeding many a nightmare within the furtive imaginations of those poor souls who were unfortunate enough to have stumbled across its pages. Not for the faint of heart or constitution, these comics are perfect for those who get a thrill from spine-tingling chills. If you’re looking to take a frightening excursion into the macabre, you have come to the right place… please, keep on reading. Vintage horror comics are finally at your fingertips with the click of a mouse, and you can download Eerie Publications comics right here in all their shocking, bloody glory. Revelling in their offensiveness, legendary titles such as Weird never pulled a punch when it came to portraying brutal horror art in all its pulpy, gruesome glory. Contemporaries of Warren Publishing and their iconic trio of Creepy, Eerie and Vampirella, Eerie Publications plied their dastardly trade in a time of great social unrest and upheaval in the US. When many social boundaries were being tested and pushed, this company burst onto this scene with a plethora of magazines catering to every kind of fearfully fertile imagination possible. Witches Tales, Shock, Chilling Tales of Horror, Tales from the Crypt, Weird, Tales of Voodoo and Murder Tales; there is a veritable smorgasbord of titles for you to digitally download for your own twisted pleasure. Not limited to only the horrific confines of our planet Earth, Strange Galaxy and Weird Worlds took our terrestrial sense of dread to lofty new heights, introducing fear of the unknown to the frontiers of space exploration. Is there any boundary safe from the dreaded touch of fear? No, not if you ask me. If there is anywhere, a shadow lurks… or you hear an unexplainable noise… or you find yourself alone… you are alone. Unless you download Eerie Publications comics to take with you. 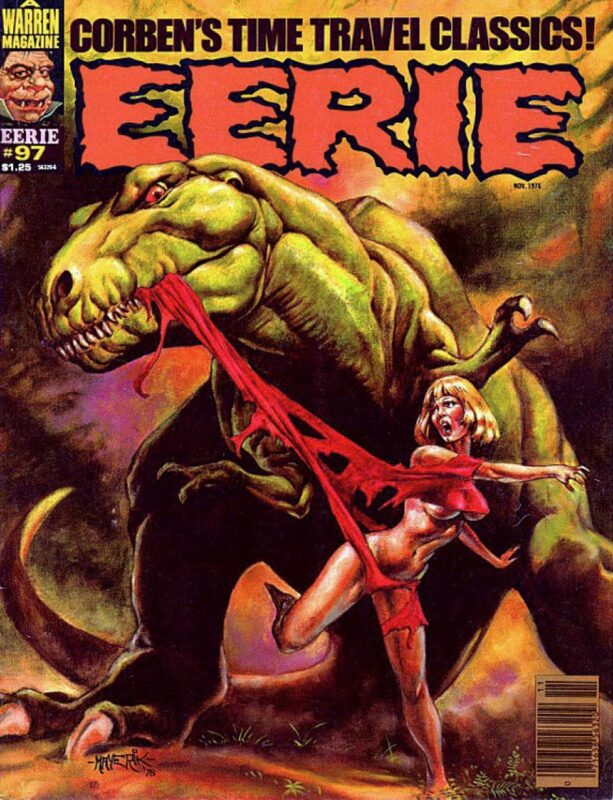 Vintage horror comics are a great inspiration for budding writers and graphic artists alike, and if you need a source of inspiration download Eerie Publications right here and right now. You won’t be disappointed. Books Inc. have scoured the internet and done the legwork for you, collating the published works of Eerie Publications in a format that you can access today, right now. Come on, need inspiration for your next project? Or do you just want to take a waltz down your own darkened and twisted memory lane? Download Eerie Publications comics and make every one of your wildest dreams or very worst nightmares come true. I dare you, you will not be disappointed… this is vintage horror goodness at its finest.